You are here: Home / Basketball Betting Promotions / Deposit Bonuses / Match Bonuses / Sportsbook Bonuses / Sportsbook Promotions / Collect up to $100 with Intertops’ NBA Finals Bonus! 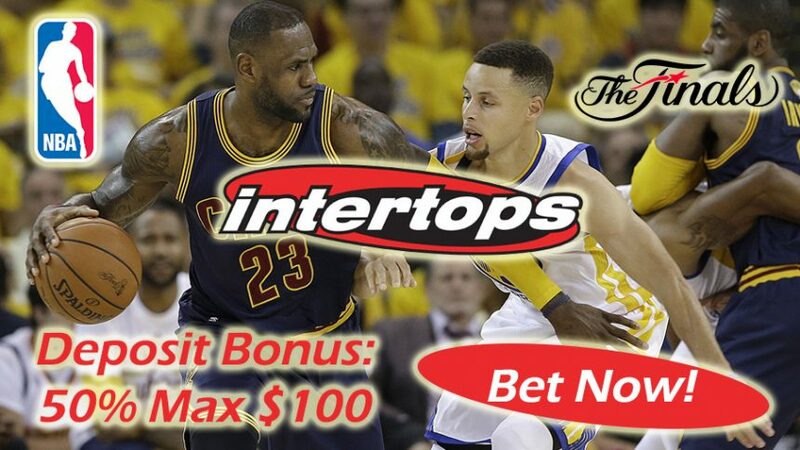 Collect up to $100 with Intertops’ NBA Finals Bonus! Join the online sportsbook now and claim the NBA Finals Bonus to get up to $100! Enjoy the NBA action with Intertops’ NBA Finals Bonus that can see you claim 50% up to $100 as a Deposit Bonus. To get the NBA Finals Bonus, all you have to do is use the Bonus Code (NBAFINALS50), and the online sportsbook will credit your account with up to $100! The NBA Finals Bonus runs until June 10, so there’s only a few more days for you to get this awesome Deposit Bonus! You can claim the bonus during the promo period either by live chat or email, so don’t forget to contact the support. This bonus offer is only valid for US and Canadian customers, so if you come from another country we suggest you take a look at the other bonus and promo deals the online sportsbook offers. Golden State Warriors defeated Cleveland Cavaliers 104-89 in Game 1 on Thursday, but the latter is preparing a comeback in Game 2 on Sunday. Cleveland’s LeBron James was visibly frustrated after the loss to the Warriors – last year’s NBA champions. Don’t forget to claim the NBA Finals Bonus before Game 2 gets underway. “Don’t matter what you do with Steph and Klay, don’t matter what you do with Draymond (Green). Give up 45 points off the bench and 25 points off turnovers on the road, it’s not a good ingredient to win,” highlighted James. Get 50% up to $100 with the NBA Finals Bonus while enjoying all the action between the Warriors and the Cavs! Claim up to $100 with the NBA Finals Bonus today!